On the edge of the great desert of Dasht-e-Kavir, in the heart of Iran, stands a city that has survived numerous natural and man-made disasters, from the sixth millennium BC down to the present day. Situated about 220 km south of Tehran, the city of Kashan, the capital of a province by the same name, glows in the dust of the desert, with its historical sites and natural beauties. Backed by Ghahrood and Karkas mountains, this city faces the Loot desert. In plains adjacent to it, the weather is hot and dry but in the mountain regions behind it the climate is generally cold, at times bitterly so. From morning to evening the desert winds blow dust and sand on the city and give it a harsh climate, but at nights the cool breeze from the mountains makes the weather rather pleasant. Steadfast and obstinate, this city and a number of cities surrounding it and belonging to the same province have been the main producers of different products throughout history. The products that today’s Kashan Province is famous for are: ceramic tiles (in fact the term Kashi in Persian, meaning tile, has been taken from the name of the city), pottery and porcelain, copper pots and utensils, fabrics (velvet, silk, cotton, gold and silver) and carpets. Kashan Province is also famous for its rosewater, which is the product of Qamsar, Niyasar and Barzook, smaller towns of Kashan province, and the three main producers of rosewater for over 800 years. The town of Qamsar, located 31 km south of Kashan, is famous for its rosewater and rose perfume. 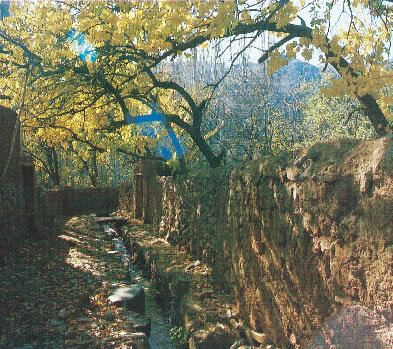 Niyasar and Barzook, are also large producers, and are situated northeast of Kashan, and on the mountains of Karkas. With cooler climate and better water resources, these two towns are generally suitable for all agricultural productions. In spring, The Ceremony of Rosewater Distillation (Marasem-e-Golabgiri), fl ower picking (Golchini) and extraction of rosewater (Golabgiri), starts when rose buds begin to open, usually mid May to early June. In this season, the whole town is fi lled with the aroma of roses and rosewater. The light pink color Mohmmadi rose used for this purpose is named after the prophet Mohammad, for its delightful fragrance. Almost every family in these cities owns one or more Golestan (rose garden), which is watered, cared for, weeded, and sprayed during the whole year. Rose bushes are planted in rows, to make fl ower picking easier. When the fl ower picking season starts, every member of the family, regardless of their positions, goes to the Golestan everyday. People come from far away to help these families. Every pair of hand is needed desperately, as this job is a race against time. Flower picking starts at dawn everyday, when the dews are sill on the roses, and continues till late morning. Early morning fl owers give the best quality rosewater. When the time is running out towards the end of the season, fl ower picking is carried out in the evening as well, but the aroma of the flowers picked at these hours is not ideal. Distillation of rosewater is carried out immediately after picking and is performed at both a home-scale (traditionally) and industrially, even though the techniques are the same. 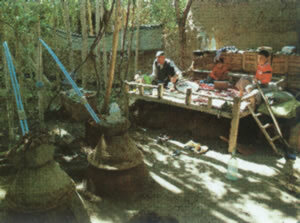 In the homes, the owner uses between 2 to 10 pots for distillation, but in a factory the number of pots is much larger. 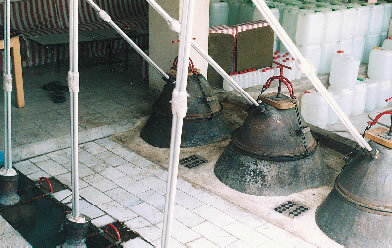 To distill rosewater, copper pots are used, each of a capacity of 120–150 liters, which are closed tightly with special lids in the same way as a pressure cooker. The bases of the copper pots are fixed into brick or clay ovens. A maximum of 20 kilograms of rose petals is put into every pot that holds 80 liters of water, and the pots are closed airtight. Each pot is connected, airtight, with an aluminum tube to a pitcher. These pitchers are placed in a ditch of running cold water and are weighted with cast iron to keep them below the water, in a way that the top of each pitcher is about 20 centimeters above the water surface. Each pitcher can hold 30–40 liters of liquid. The fire in the oven boils the water in the pot and the process of extraction begins. The vapor from the pot gradually passes through the tubes into the pitchers and changes into rosewater as it condenses through contact with the wall of the pitcher that is immersed in cold fl owing water. The process will take between four to eighteen hours and the outcome is about 35 liters of rosewater. The slower the process of extraction, the better the quality of the rosewater. A fi ne rosewater is very fragrant and tastes a little bitter. Every year from, 17th to 30th of May, the festival of rose and rosewater is held in the towns of Qamsar, Niyasar and Barzook. In the evenings music is played and people sing till midnight, to entertain the visitors and tourists, and to sooth the weary gardeners and their families. The festival is truly worth seeing.